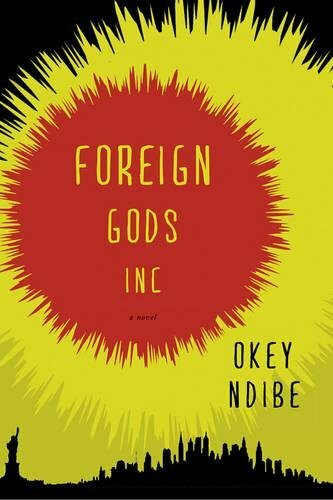 a book review by Karen Winters Schwartz: Foreign Gods, Inc.
Dr. Okey Ndibe’s second novel Foreign Gods Inc. is a dark and uncomfortable journey through the wet armpit of humanity. It’s a part of humanity that some may just not want to explore. Foreign Gods Inc. is the name of a NYC high-end art gallery in the business of selling Gods—Gods that are an expensive, hot commodity to the wealthy looking to impress. Ikechukwo Uzondu, known as Ike, is a transplant from Nigeria who has failed to obtain the American dream. Well educated, his impressive credentials are not enough to overcome his “crappy” accent, and he is forced to eke out a living as a taxi driver. The end of a four year marriage, which Ike recalls “as a period of persistent nagging,” leaves him financially and emotionally drained. When gambling losses lead to further financial ruin, Ike pins his salvation on stealing Ngene, the god of war, from his boyhood village and selling the wooden deity for a large fortune. Reminiscent of stories such as Leaving Las Vegas and Long Day’s Journey Into Night, it’s the sort of work which demands respect, but ultimately offers no salvation—nor glimmer of hope. Ike’s actions are wrought with futility, wrought with desperation, and wrought with cruelty. Unlike Mack and the boys in Steinbeck’s beautiful Cannery Row, Ike is not very likable, making it difficult to empathize or root for his success. His frail attempt at redemption comes too late and falls short of making him a laudable character. But even the mention of Steinbeck is something. If it is all about the writing, if it’s all about the literary significance, if it’s not about the pleasure of the story and the pleasure of reading, then Foreign Gods Inc. should be considered brilliant. Ndibe’s writing is sharp. The pacing is excellent. His characters are well-developed. The novel is culturally and politically significant. While dark humor softens the misery inflicted on and by the characters, it just might not be enough to make it worth wiggling through the armpit hair.